The Vinturi Essential Wine Aerator makes for a great gift for a wine lover – indeed that wine lover could be you! It looks great but the reason I want to buy a stock of these items is that while I do enjoy a glass of wine myself, I have a number of friends who are very knowledgable on this subject. I mean the kind of people who have taken wine courses, travelled to vineyards and have created wine lists for top restaurants! While I am happy to choose a bottle of wine for myself, I find myself staring at the shelves in my local wine store quite blankly, when I need to buy a gift for them or if I am calling over to them for dinner (lucky me!). I am so afraid to make the wrong choice – rigth grape, wrong year, good winery, not their best wine etc. The Vinturi Wine Aerator is a great solution for me. Wine needs to breathe to bring out its full flavor. For me that normally means opening a bottle of red about half an hour before I need it. That is of course if I am patient or if someone doesn’t arrive at my door unexpectedly. The Vinturi effectively aerates the wine as you pour. It is non drip, has a sediment filter and is dishwasher safe. Price wise it normally comes it at around $40 (and up) and I have often spent that amount on a bottle of wine for one on my wine buff friends – as my anxiety level increases in the store my budget goes up! As I said I have use for several of these, so I have been looking for the best price and the best price I can find for a single unit of the Vinturi Aerator, at the moment is $33.10 at Amazon. To be honest with you, I did find one store where they are $31.95 but that is if you are buying 24 or more and even I don’t need that many! 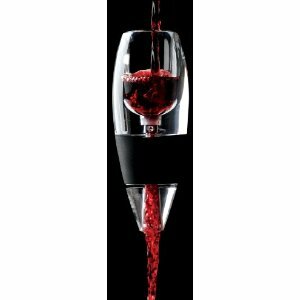 I have shown images of the Vinturi Essential Wine Aerator for red wine here. You can also get them for white wine. I have to say I have never aerated a white before drinking it, but then perhaps I need to check with the experts on this one!